I saw this DVD on sale at some supermarket. 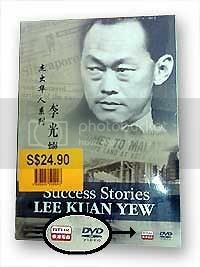 I have seen books on Lee KuanYew but this is the first time I have seen a DVD on him. I wonder if this political film complies with the above conditions. I wonder if there is any animation in it? What about any moving newspaper cuttings to dramatize thetumultuous events of our history? Well, I guess the answer is available for $24.90.